I have 20 years’ experience working with people with learning disabilities, since being seconded from a theatre support worker post at Derriford Hospital in Plymouth to work in the learning disability team. It was supposed to be for seven months. I am still there 20 years later, so there was obviously a need. I don’t know of a similar post that does what I do – working with people with a learning disability attending outpatient appointments or day surgery. When I started about 600 people with learning disabilities had appointments at the hospital every three months, but the learning disability nurses only saw at most two of the most complex cases every week. I was there to see the patients they were not seeing. I discovered that a lot of people with mild to moderate disabilities, who probably had a couple of hours community support to help them with such things as banking, were not attending. This was not in my job specification, but I decided to look into it. What I found out was amazing. It came down to simple things that could be fixed, like transport – their bus pass not being valid until 9.30am but their appointment set for 9am. They were not phoning to let anyone know – the idea of calling the hospital was too much for them. This was for appointments for oncology and neurology at a large acute hospital. When a patient arrives at the front entrance, the colours and zones for different parts of the hospital can be too confusing, and most were just turning round and going straight home. If they got as far as the right department, it seemed too busy to them – the clinic was running late and nobody talked to them, so they walked out. The few that actually made it in to see the consultant often did not understand the conversation, making them unable to follow changes to their medication, for example. I went for a coffee with one woman who missed appointments because she could not read the letters from the hospital, and I went through the calendar with her. Now when she gets a letter she calls me, I check the appointment and she knows to put a cross on the date on the calendar. It gives her some of the responsibility to call me – it has given her some control. I have been a birthing partner to a single mum who asked me to support her. It was such a privilege – I can see why dads come out of the delivery room strutting like a peacock. I am happy to have my bloods taken with a patient. I provide continuity through appointments. It is about getting them in, being a face they know – the same person, so they can make a connection. I know the end goal, and there are always ways and means of getting to where you need to be. It might take longer, need desensitisation work, you might need a completely different consultant, but everyone is entitled to the same healthcare. Sometimes it is as simple as a longer appointment or holding it in a quieter area. It is about finding out what works for each patient. I create certificates and use homemade contracts with more able patients. One patient had his leg amputated after having cancer. He repeatedly refused to have a prosthetic leg. I got involved when he came into fracture clinic because he had fallen. I asked him why he didn’t want the prosthetic leg, as having it would mean he would not struggle so much on his crutches. He said it was too much to-ing and fro-ing to hospital, but the main reason was he would have nowhere to put his shopping. It turned out that he was using his empty trouser leg to carry shopping home. This was a big thing for him. He did not understand that with the prosthetic he would not need the crutches any more. I signed a ‘contract’ with him promising that if he turned up and had his fittings and tried the leg, I would buy him a backpack for his shopping. He got his leg and the backpack. The biggest challenge was a patient aged 18 who came in for a urology appointment with his parents soon after I started. The consultant said he was going to request an appointment for him for an ultrasound check. I asked if I could get it done today – the consultant said if I managed that he would buy me a bar of chocolate. The ultrasound appointment showed he needed a CT scan. I got that done, as well as blood tests. It was all completed within five hours – it could have taken five outpatient appointments and six months to show he needed a kidney removed. We had the whole process done by 3pm. I used that case in my presentation to the trust board as evidence that my post needed to be permanent. I meet with advocate groups on my days off and they launched a petition to make my post permanent. It was nice to have that backing from people with learning disabilities. I don’t find it difficult to challenge consultants if I need to. If I can’t stick up for myself how can I be an advocate for my patients, whose needs are due to learning disabilities? This is what I trained for and what I have worked hard to be able to do – to be a voice for people with learning disabilities. Now I get consultants’ secretaries ringing me to tell me someone is coming in and asking for my help. The charity Mencap recently released a report saying there are 1,200 avoidable deaths of people with learning disabilities in the UK every year. It is shocking. We need to get people into hospital for their appointments, not coming into the emergency department when it is too late. I was astonished to be nominated for the award – it’s my work and I love it. I think I am lucky to be able to work with these patients. Winning will give me a platform to show this role’s value. I saved my trust £150,000 last year and was paid £18,000. If trusts can’t make services better for people with a learning disability because it is the right thing to do, perhaps this will show them that it is worth doing for the money. Sean McCann had cancer in his leg and jaw. 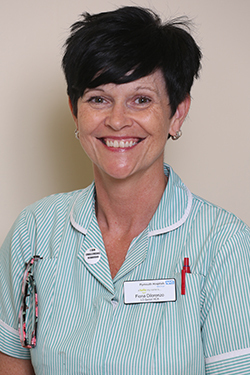 When Fiona Dilorenzo came into post, she was looking through the outpatient non-attendances and noticed that he had missed four or five oncology appointments. Ms Dilorenzo, a specialist learning disability healthcare assistant at Plymouth Hospitals NHS Trust, says: ‘When I got hold of him I found out that he had a 70-mile round trip to get to the hospital and his disability money had been stopped. ‘When I called up social services to ask them what they were playing at they said he had not filled out some forms. I told them he had nobody to help him as his mum had died, so they wanted him to travel to Plymouth to see them. Mr McCann says that since meeting Ms Dilorenzo he has had plenty of help and support. ‘Fiona is excellent. She always goes the extra mile. It is just really nice to have help sometimes when I’m dealing with medical stuff and when I’m at home and have had surgery and don’t feel well and I am on my own. ‘There are things that Fiona has done for me. I had to get a health assessment to get my money. She’s marvellous. If I had not had her it would all have been a lot harder. ‘She rings people for me and gets back to me and lets me know what’s going on. Sometimes when I am on my own and talking to people I am not sure what they are saying – I find it hard work. Sometimes I get infections and Fiona is there waiting for me when I get to the hospital. She is always on time. ‘Last time I went to the hospital I had an infection and something else and had not seen her for a short while, and she reminded me that I can ring her and ask her for help even if I haven’t seen her for some time.